As we start off another year I would like to take the opportunity to welcome back all of our returning families, as well as those of you who are new this year. Our skilled and devoted staff is eager and excited to start working with your children. Our hardworking custodians have ensured that the classrooms and the other facilities were thoroughly cleaned. This year we are happy to welcome back Teacher Sarah Johnson who will be teaching in grade 1. 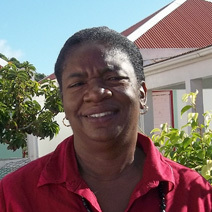 Joining us is also a new aide Miss Henrietta Hassell who will assist in grade 1. This schoolyear Spanish will be added to the curriculum. This lesson will be given by the enthusiastic Tr. Tracy Zagers our colleague from the Saba Comprehensive School. This will be given to the two grade 6 classes on Wednesday. This year we would like to get our outdoor playing areas improved with new equipment .We would like to get some donations for this or even the equipment. Such as better swings, backboards for basket ball, a merry go-round, see -saws. If anyone is willing to help it would be very much appreciated by the entire school. We are also looking to start our own green-house . We would love your help with this also. We are looking forward to an outstanding school year and we know it will be a great one. Together as a family we will achieve with one step at a time.